Am 23. Juni 07 ist bei uns die erste Aue mit Lamm dieser schönen, alten Rasse angekommen. Der Amerikanische Klub hat mir die Erlaubnis gegeben, diesen Standard zu veröffentlichen. acceptable, but less desirable traits, and unacceptable/disqualifying traits. Mature rams weigh between 120 and 180 lbs. Mature ewes weigh between 80 and 120 lbs. Polled sheep, or sheep with scurs only. 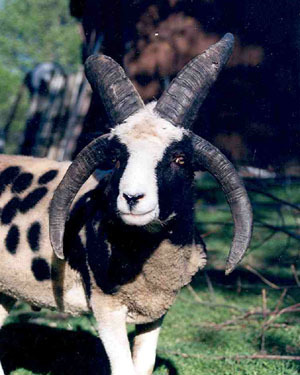 Two-horned rams having small, weak, feminine looking horns. 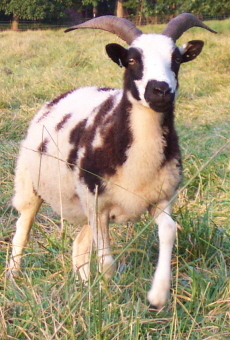 Two-horned ewes having small or weak horns. Photo Policy: photos used on this website are on loan from their owners. All photos remain the property of the owners, are copyrighted to them and my not be used without explicit permission of the owners. JSBA members who abuse this policy can lose their membership in JSBA. Both members and non-members are subject to all copyright laws.